If you’re looking for a manicured mega mall, Commercial Drive is not for you. If you’re looking for funky, ethnic, hip stuff, it’s probably just the place. The interesting part starts at the north end around Venables Street. Locals call this place The Drive. If you want to start with gifts, or nice things for yourself, check out Dream Designs at 956 Commercial Drive. It’s an alternative home store that sells bedding, bath stuff, candles, lighting and excellent soap. It’s famous for its fabric. It has the sort of things people back home would be happy to get instead of the little collector spoon with the crest on the handle. If you’re hungry, you’ll find several ‘by the slice’ pizza places, all at great prices. The best one is the first one you come to, The Pizza Garden at 1042 Commercial Drive. We’re not talking fancy, just good and cheap. A slice of pizza is $1.25. You’ll find cheaper as you go along, but not better. Megabite Pizza is a great place for a good, cheap, big slice of pizza. However, be warned. 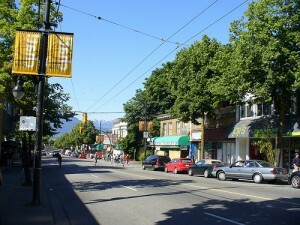 There are many places to eat on Commercial Drive. If you succumb now, you may be sorry you squandered your hunger on pizza when a lot of exotic alternatives await you. If you want dessert to go with the pizza, on the same block, you may have passed it already, is Dutch Girl Chocolates at 1002 Commercial Drive. The chocolate is wonderful and, if you show up at the right time, you can watch candy being made. Most any time you can see rivers of dark and milk chocolate in the kitchen. It’s a delicious sight. At 1046 Commercial Drive you’ll find Tony’s Deli that specializes in delicious Italian salads including Sundried Tomato Penne or Tortellini Pesto, a dozen different Panini, muffins, coffee cakes and rich Italian coffee, all served in a homey, authentic setting. 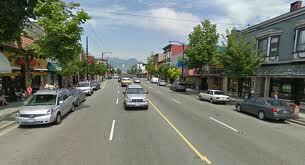 In the next block, on the same side of the street, is Urban Empire at 1108 Commercial Drive. Like Dream Designs, it has a lot of things that would make great gifts for the right person: strings of moose lights, a potato gun, a drag queen doll, bizarre refrigerator magnets and an extensive selection of unusual greeting cards. On the next block, at 1212 Commercial Drive, you’ll find one of the stars of The Drive, Havana, a restaurant, gallery and theatre combined. When you go into the restaurant with its mismatched wooden chairs, red velvet booths, ceiling fans and decorously graffitied walls, you’ll think you’ve been teleported to some exotic location, perhaps the real Havana. It’s hard not to stay here a while even if you’ve stuffed yourself on pizza and only have room for a latte that comes in a bowl. The food is good, the crowd is interesting and the people who work in the place are cool and friendly. It would be easy to spend a lot of time at the Havana. Don’t miss the art gallery. By the way, you can buy excellent Cuban cigars and smoke them on the heated patio. As you go along, if you haven’t had coffee at the Havana, you’ll pass a number of Italian coffee places, many of which have been on The Drive for a long time. You can get deli sandwiches, excellent coffee and pastries. At the Abruzzo Cappuccino Bar at 1321 Commercial Drive, you can get coffee and watch sports via satellite on a giant TV. If you want something healthy but haven’t stopped at the fruit and vegetable markets along the way, try Juicy Lucy’s Juice Bar. You can get fresh squeezed and fresh made fruit and vegetable juices and fresh sandwiches and pastries. For something more substantial, try Bukowski’s Bar and Bistro across the street from Juicy Lucy’s at 1447 Commercial Drive. This three-tiered restaurant has live jazz Monday, Thursday and Saturday nights and spoken word open mike poetry readings on Tuesdays. At 1526 Commercial Drive, you’ll find Kalena’s Shoe store featuring very fashionable, very beautiful Italian shoes at very reasonable prices. This place has been in business since 1967 and over the years has expanded into two adjoining storefronts. There are men’s shoes, women’s shoes and a whole shop sized area devoted to sale shoes. Now that we’ve help you get started, you can take it from here. Have fun.